Martin Cooper at a 2009 ceremony in the northern Spanish city of Oviedo where he received a research award. Greene: First phone clunky. Cooper said phones will get smaller, maybe implanted in skin. Editor's note: CNN Contributor Bob Greene is a best-selling author whose books include "Late Edition: A Love Story" and "When We Get to Surf City: A Journey Through America in Pursuit of Rock and Roll, Friendship, and Dreams." (CNN) -- Sunday is the anniversary of something that undoubtedly has changed your life. Whether for good or for bad is a question only you can answer. On this day in 1973 -- on April 3 of that year -- a man did something no one had ever done before. You may bless him for it or curse him for it. At this juncture, it hardly matters. The impact of what he did is so enormous that judging it now is almost beside the point. The man's name was Martin Cooper. He was 44 at the time. He made a cell phone call. The world's first. At least the first public one; the cell phone had been tested in the lab, but never tried in the real world. "As I walked down the street while talking on the phone," Cooper once told an interviewer, "sophisticated New Yorkers gaped at the sight of someone actually moving around while making a phone call." There had been car phones before -- mobile radios, really. They were powered by heavy equipment that had to be stashed in the trunk of the automobile. But Cooper, who was the general manager of Motorola's communications systems division, had the idea that people didn't want to be tethered to a stationary telephone, even if the phone could ride along with them in their car. He thought that the phone should be so portable that it could go anywhere they went. "People want to talk to other people -- not a house, or an office, or a car. Given a choice, people will demand the freedom to communicate wherever they are, unfettered by the infamous copper wire." As I say: Bless him, or curse him. That person who annoyed you to the point of near rage this morning -- the one who was talking on his cell phone so loudly and so rudely that you felt your blood pressure rising? Martin Cooper, no doubt unwittingly, unleashed him on the world. The glares you received from your family on your last vacation -- after the 15th time your office called you, or you called your office, even though you were supposedly at the beach, on your own time, relaxing? Martin Cooper, whether he wanted to or not, made that happen. He once told Maggie Shiels of the BBC that his concept for the cell phone -- the "personal telephone," as he referred to it -- was that it was "something that would represent an individual, so you could assign a number not to a place, not to a desk, not to a home, but to a person." It must have sounded ideal -- a telephone that moved wherever its owner moved. And of course, its benefits have been many. The world, literally, could not live without cell phones now. If they were suddenly to be outlawed, or to magically disappear overnight, the planet would have a nervous breakdown. Cell phone service has become like the air itself: taken for granted, not given much thought until it's unavailable. When people lose or misplace their cell phones, they often report feeling a sense of emptiness, of panic, almost of grieving. 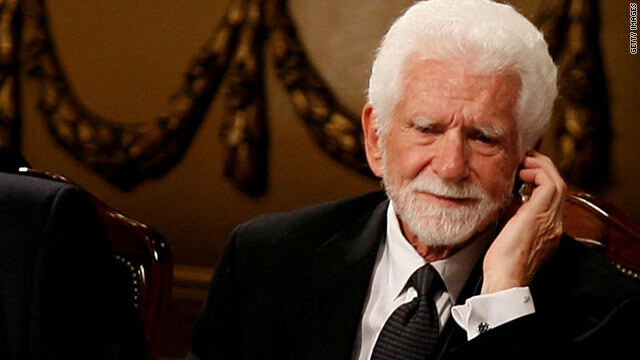 When Martin Cooper made that first cell phone call, he did not make it to another cell phone. People didn't have them yet -- who could he call? No, he made the cell phone call to a land line -- specifically, to the land line of his chief competitor at Bell Labs. Motorola had beaten Bell to become the first company to make personal cell phones work. Cooper, you might say, rubbed it in. Think how the Bell Labs research engineer must have felt when he heard Cooper calling him from the noisy streets of Manhattan. That first cell phone was so big that it was often described as resembling a shoe, or a brick. It weighed 2½ pounds. Cooper would joke to friends and colleagues that the calls from that phone would have to be short in duration: Who had the strength to hold it to an ear for very long? Before that third of April 38 years ago, people could get away with saying that they would be unavailable for hours, for days, for weeks at a time. Their phones -- their land lines, at home or at the office -- could ring and ring. They could declare "I won't be there," and it would mean something. Martin Cooper altered forever the definition of "there." It became a place in motion -- a place that was always accessible. Back then, no one was yet thinking of watching movies on their telephones, or playing games on them, or writing letters on them that would fly through space and end up on someone else's phone. But Cooper understood that the big trick would lie in making the phones smaller and lighter; he told the BBC that one idea was to make the personal telephone not just portable, but "even have it embedded under your skin." Maybe that's what is coming next. What Cooper started with his call on that day was a relentless drive that would all but do away with the notion that a person could not be reached. He's still alive, by the way. He's 82. He still works in the technology field. When I was able to reach him this weekend, at Heathrow airport in London, our cell phone connection was so lousy that we both ended up laughing over our repeated "Can you hear me now"s. It was hopeless. I found myself wondering if any of the people around him in the terminal, some of them undoubtedly yakking into their own cell phones, had any idea who the amiable gentleman in their midst was. We made an appointment to talk again this week, when he is back in the United States. In next Sunday's column, I hope to be able to tell you what Cooper makes of the new world he ushered in-- whether he ever feels like Dr. Frankenstein. In the meantime, happy anniversary, sir.